I had the awesome opportunity to partake in this cool blog tour for Rachel Hawkins second book! I was able to ask Rachel some questions and her answers are just as funny as her book. 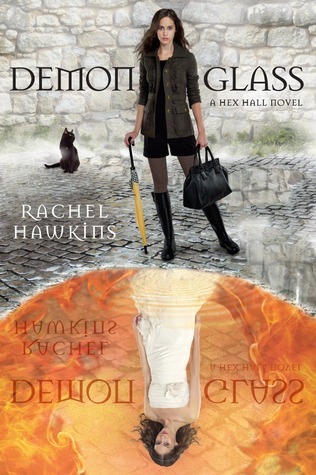 I will post my review of Demonglass later this afternoon. I'm still processing it! Well here are Rachel's hysterical answers. I asked her question like I was James Lipton from Inside the Actor's Studio. I must thank Laura H for that. I was freaking out because I don't ask good questions. Any and all variations of the f-word. Or does Amazeballs count? Because I used that one A LOT. The sound of liquid pouring into a glass. Someone who burns monkeys (sorry, SNL joke.) Um...accountant? I have 3. Kate Elliot's COLD MAGIC, Fannie Flagg's FRIED GREEN TOMATOES AT THE WHISTLE STOP CAFE, and Richelle Mead's IRON CROWNED. Pamplemousse- super! Or should I say amazeballs? !